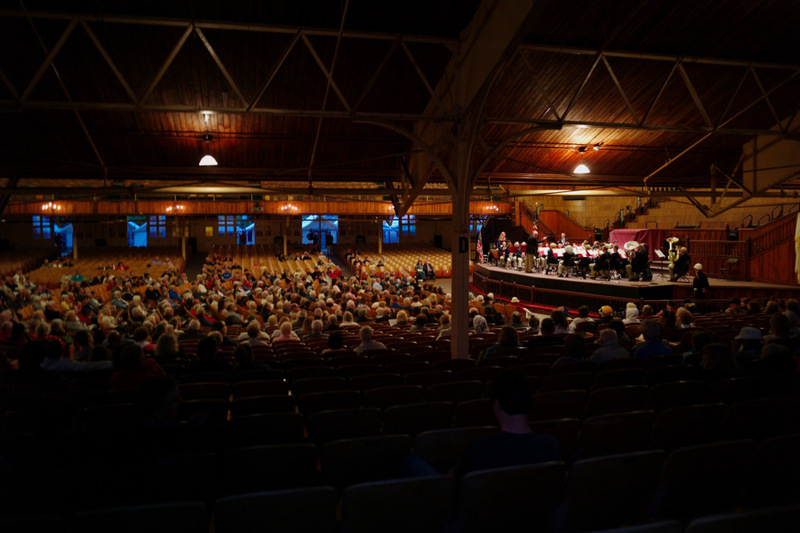 The Great Auditorium of Ocean Grove. Does this look like a town in need of a special redevelopment zone? Paul Goldfinger photograph. Click to enlarge. That is how they justified turning that property into a commercial zone. That is how they were able to grant permission for condominiums, an underground garage, retail, restaurants, etc. All of this is contrary to the goals of Ocean Grove’s Master Plan which stressed the residential /historic nature of the town. Currently the latest consortium of big shots in town will push hard to begin a revised version of that project. It’s not clear from the gobbledygook that they are putting out lately, that the changes which they are now happily promoting will avoid complications such as environmental damage, congestion, worsened parking distress, and further deterioration of quality of life for residents. Nor is it clear that those changes are legal and proper according to land use laws in New Jersey. We think not, on both counts. b. The discontinuance of the use of buildings previously used for commercial, manufacturing, or industrial purposes; the abandonment of such buildings; or the same being allowed to fall into so great a state of disrepair as to be untenable. c. Land that is owned by the municipality, the county, a local housing authority, redevelopment agency or redevelopment entity, or unimproved vacant land that has remained so for a period of ten years prior to adoption of the resolution, and that by reason of its location, remoteness, lack of means of access to developed sections or portions of the municipality, or topography, or nature of the soil, is not likely to be developed through the instrumentality of private capital. d. Areas with buildings or improvements which, by reason of dilapidation, obsolescence, overcrowding, faulty arrangement or design, lack of ventilation, light and sanitary facilities, excessive land coverage, deleterious land use or obsolete layout, or any combination of these or other factors, are detrimental to the safety, health, morals, or welfare of the community. e. A growing lack or total lack of proper utilization of areas caused by the condition of the title, diverse ownership of the real property therein or other conditions, resulting in a stagnant or not fully productive condition of land potentially useful and valuable for contributing to and serving the public health, safety and welfare. g. In any municipality in which an enterprise zone has been designated pursuant to the “New Jersey Urban Enterprise Zones Act,” P.L.1983, c.303 (C.52:27H-60 et seq.) etc. h. The designation of the delineated area is consistent with smart growth planning principles adopted pursuant to law or regulation. L.1992,c.79,s.5; amended 2003, c.125, s.3. Can a review of statutory reasons for designating an area for redevelopment that none relate to the North End be confirmed ? (It certainly is not “smart growth planning” according to the last criteria.) Is court action necessary ? Is pro bono service or State agency interaction available for such a task ? There were no code violations filed by Code Enforcement prior to the Committee deciding the North End was ‘an area in need of Redevelopment ‘. Based on this fact, I agree with Kevin Chambers that the entire NERP was and still is a fraud. So then, I guess the funds are coming from my tax bill. Editor’s note: Of course it is private capital—the problem is that the CMA didn’t want to cash in its private (land) capital without a zoning manipulation, but that desire is not a criterion for the Township to give it that “re-development” designation. The CMA was well able to privately finance the development of the North End—but what was the motivation for the Township Committee to stick its neck out and agree to this illegal change in zoning other than the quest for more tax money? Let’s hear from Kevin Chambers. As it turns out, I was in court today for one of the two challenges I have brought against the Board of Adjustment. The reasons are the same for what makes the North End development invalid. The Township in all three cases is using invalid zoning, zoning in violation of State and federal law, zoning in contempt of both a State and Federal Court order, and therefore are using invalid zoning definitions to permit uses and density that is in direct violation of law. Neptune, using your tax dollars, has sent an attorney to court to make sure those violations of law continue at the cost of OG residents. I hope that this new judge will use reason and follow the law to prevent any further violations of zoning law by Neptune. Isn’t the reason that CMA going along with this illegal development is because they cannot afford the exorbitant taxes on this area? Wouldn’t it make sense for CMA and the citizens of Ocean Grove to leave Neptune’s clutches and use our own tax money to right this listing ship and honor the Founders Master Plan. Your tireless efforts are appreciated. It seems the powers to be at the helm in Neptune are not the least bit interested in opinions from those who live where they are going to rake it in. Complete disregard and ignoring rules. Hoping someone calls them to task on some law or ordinance and makes a big stink so that even the news can cover it. So disgusting how they disregard the residents.